It’s game 1 of the 2018 NBA Finals. Tied at 107 apiece between the Golden State Warriors and Cleveland Cavaliers with 4.3 seconds to go, only one defender is standing between the Cavs’ shooting guard JR Smith and the basket. Thanks to social media and one iconic television shot of a wretched LeBron James, it’s common knowledge that Smith, rather than going for the hoop only a few feet away, took the ball almost to half court before wheeling the ball back to point guard George Hill. Hill was then forced to feign a 3-point shot with half a second left and one of the toughest forwards in the NBA running at him as if he were holding the Larry O’Brien trophy right there. The shot was blocked, and the Warriors would go on to outscore Cleveland by 10-points in overtime en route to a win in Game 1. Ultimately, only Smith can know what was going on in his mind at the time, and he does claim to have known the score, blaming the bizarre play on miscommunication over a timeout. 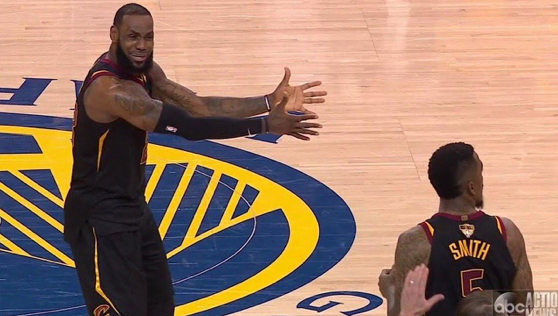 To the millions watching at home (and LeBron), however, it appeared as if Smith spaced out and forgot the Cavs only needed two points to win, and it cost his team the game. Sports are great dumb. They require baffling amounts of preparation for moments which may only last a few seconds, but can determine the outcome of a game, series, or an entire season. At the same time, however, it’s impossible to train for every scenario you’re likely to encounter on the court. Thousands of hours of practice have made JR Smith into an above average NBA player, but no matter what, there is only so much an athlete can do to prepare themselves for having the ball with 4.3 seconds remaining in a tied NBA Finals game. Anxiety is one of the most challenging emotions to manage in competition. 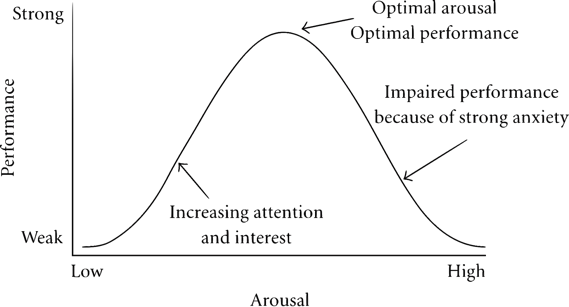 As illustrated by the Yerkes–Dodson law, too little can make someone bored, while too much can be stressful and cause an athlete to underperform. Traditionally, sports psychology has given athletes of all disciplines the ability to manage anxiety and succeed in situations which are impossible to emulate in typical practice environments. One of the most widely used methods in sports psychology is known as “Mental Imagery.” It calls on athletes to imagine themselves in various scenarios. Like a kid might picture themselves hitting with the bases loaded in Game 7 of the World Series, the idea is to visualize an event or action with such detail that an athlete won’t be caught off guard if it actually happens. However, the technique is inexact, and the success of the exercise is dependent on a player’s ability to convincingly envision themselves in hypothetical circumstances. 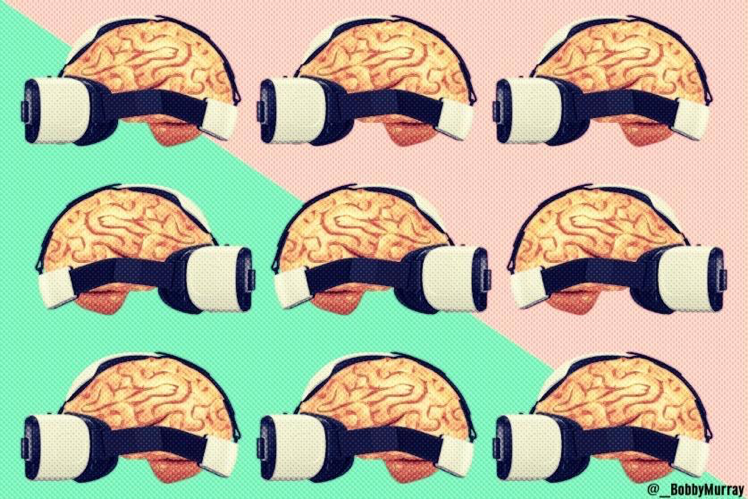 STRIVR labs, a VR company which emerged from the shadows of Stanford football, is making waves in the world of professional sports for their cutting-edge programs which turn mental imagery into something palpable. 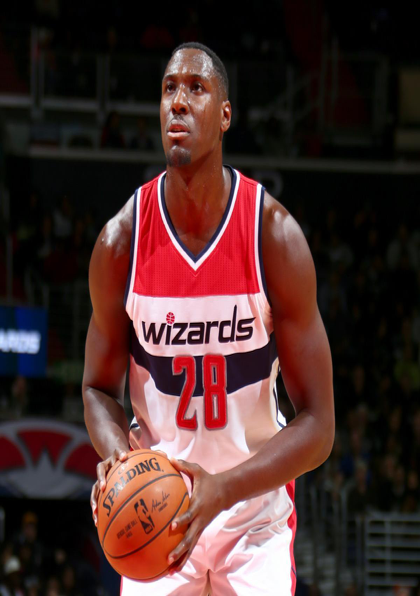 Ian Mahinmi, a center in the NBA for the Washington Wizards, is one of the company’s more notable success stories. In his career, Ian Mahinmi has shot 54.1% from the field and has been an above replacement level player. In the 2013-2014 season, however, Mahinmi’s free throw ability tanked, fell apart, and then exploded. Making just 3 in 10 shots, Mahinmi had the second worst free throw percentage in the league amongst players with at least 58 games – an exasperating punch line to his career FT% after it had already fallen in two of the last three seasons. One year later, with Mahinmi still a below average shooter from the free throw line, STRIVR proposed a unique proposition. Using virtual reality, the 6′ 11″ Frenchman could take as many free throws as he wanted and make every single one, all without sacrificing significant practice time. Despite having to share a single headset with an entire team, in weeks where Mahinmi used VR, his made free throw percentage improved dramatically. 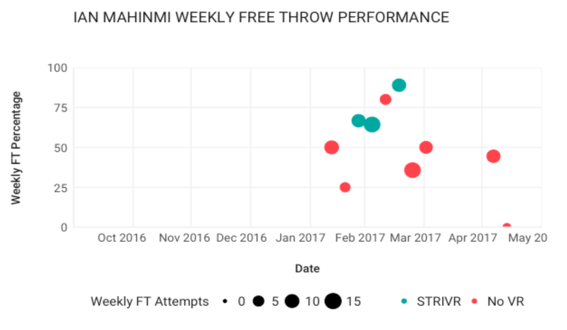 While STRIVR has not reported any week-to-week data from the 2017-2018 season, Mahinmi continues to improve, and raised his FT% by 13 points to 70.3. STRIVR, on their company blog, boasts about another success story, Conrad Ukropina, a kicker on Stanford Football who went from a backup roll in his first three years to have one of the best seasons in school history. Ukropina, now an employee of STRIVR, focuses on a 2015 game winning field goal he sent through the uprights against Notre Dame in the final seconds of the fourth quarter. Leading up to the field goal attempt, when most kickers can get into their own head and fall on the wrong side of the Yerkes–Dodson anxiety curve, Ukropina credits virtual reality with keeping him calm. After watching hundreds of similar, successful kicks from immersive camera angles, to Ukropina, attempting the real thing was just matter of following through on a familiar task. As more teams and athletes adopt virtual reality, the limits and possibilities of the technology will become more defined. Already, the New England Patriots, Washington Capitals, and even the U.S. Ski & Snowboard team are turning to VR to sharpen the mentality of their athletes in ways which will boost performance during game-changing, high-anxiety moments. While it’s unlikely to ever eliminate “Oops” moments from happening in sports, it appears that some in the industry are eager to pursue VR with the same intensity that has transformed understandings of training and analytics in an athletic context.